Data is more detailed and actionable than ever thanks to cross-device advances, so what’s next? It’s no revelation that auto marketers have turned their sights squarely to digital. The savvy auto marketer has incorporated nontraditional channels to target and more actively engage the increasingly comfy cross-channel consumer. The evolved consumer relies on digital platforms for everything from research to media consumption to supporting various steps toward purchase. Even more specifically within digital, auto marketers have started to look beyond desktop, training their consumer marketing eye on mobile, where consumers are meaningfully engaging with and considering the auto brands who play there. As marketers, we already buy into digital—so what’s the added power of mobile? Well, as a rapidly maturing option, mobile affords useful data and data-driven marketing opportunities that speak to the changing day-to-day needs of our consumers. Illustrating auto marketers’ understanding of this, mobile spend was at 71% compared to desktop’s 29% in 2017, according to eMarketer. 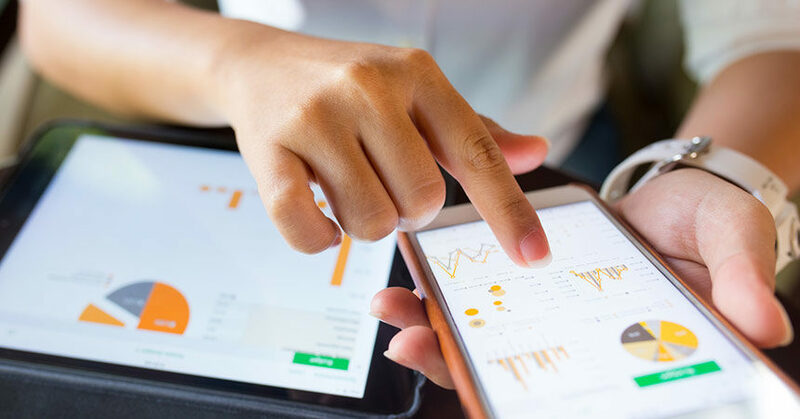 Manufacturers, including Audi, have seen the benefits, so they are investing more, as well as activating with the most effective mobile formats. 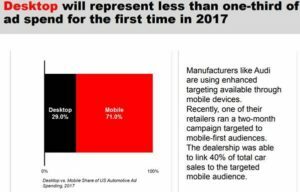 Consider this: According to eMarketer, one of Audi’s retailers recently ran a two-month campaign targeted to mobile-first audiences. The dealership was able to link 40% of total car sales to the targeted mobile audience. One can see how the ability to target, engage, and then attribute performance to an audience is critical to marketing efficiency. Having the richest data on hand to model one’s audiences, then target them in their preferred channel with enough data to calibrate any further spending, is incredibly powerful because it greatly reduces waste and allows you to build on what you know to be working. Going forward, that appears to be mobile. In an earlier report, eMarketer shared data from the performance marketing agency Performics and Northwestern University showing that U.S. internet users spend one-fifth of their time interacting with auto companies via mobile device—just behind in-person representatives. Digital and mobile have earned auto consumers’ comfort and trust within the auto research, consideration, and purchase journey. 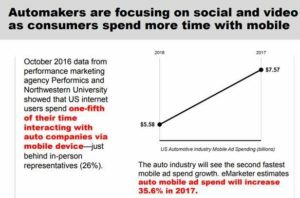 Knowing this shift of consumers from desktop to mobile is underway, auto marketers are beginning to venture more wholeheartedly into mobile, with a greater focus on the most fruitful formats: social and video. Of the four hours per day the average consumer spends on their phone, 50% of that time is dedicated to social media. Social apps on mobile are one of the most valuable spaces for data collection available to marketers, because it provides the missing link to successful conversion: context. Based on a consumer’s interests and how those tie into a social media profile, combined with mobile information–like proximity to a dealership at the time of interaction, automotive marketers can better establish a connection with the consumer and increase likelihood of conversion. Every aspect of messaging should be tailored based on consumer data. For example: displaying creative with the “test drive now” message when a consumer is on a social site within a five-mile proximity of the dealership. These types of campaigns should progress as consumers move through their individual customer journeys, consistently demonstrating their vehicles of interest across multiple channels and devices, and evolving based on interactions with the brand on-site, off-site, and across social channels. Video is the other increasingly prominent key to success. But just like all marketing content, consumers expect their experience to be personalized. For the well-trained cross-channel marketer, segmenting audiences and serving them the appropriate video content should be a natural (and necessary) part of the conversion process. For example, providing consumers with the opportunity to “test drive” the car they’ve been consistently viewing on an automotive website is a strong engagement tactic. In fact, per Animoto, 73% of consumers are more likely buy a product after experiencing a “demo” video. This can work on both a macro brand level and a micro dealership level. Consider the powerful opportunity of serving up a personalized video ad for a nearby dealership on the Facebook mobile app to a user who has consistently demonstrated interest in a specific vehicle. It creates the trifecta: relevant messaging delivered at the right time (thanks to geo-targeting) to a consumer who is primed to convert. The opportunities found in social and video are constantly evolving, with some automotive brands already extending video efforts into virtual reality (VR) with virtual test drive experiences. The best opportunities will come out of richer audience data across channels and the opportunity to reach consumers on their most-used platforms with personalized messaging that prompts conversion. Global director of strategic accounts with IgnitionOne, Rachel Pierson works closely with the marketing teams of major automotive manufacturers and their agencies to develop strategies and solutions to increase marketing performance. A graduate of Central Michigan University, Rachel has 14 years of automotive marketing and advertising experience. She currently resides in Detroit. 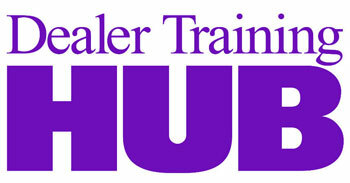 It is amazing what is happening to the Automotive Sales industry and is Truly an Exciting time to be apart of it !